Commercial farms have come under a lot of scrutiny lately — and for good reason. We have discovered how much poison is sprayed onto those beautifully colored fruits and vegetables in the supermarket and it's killing us and making us sick. More than 70% of food in America is processed and almost two-thirds of the food available comes from only 4% of the farms. Rebelling doesn't have to mean sneaking around taking photos of worse practices on those farms or protesting in the streets. It "should" mean that we know how to grow our own groceries, or at least, look around for farmers markets or local farms. So let's start with growing our own groceries. Have you started your seeds indoors? Whether you have or not, I hope these vegetable gardening tips will encourage you to grow your own fruits and vegetables. Learning this skill could be the difference between starving or survival if there was ever a long term power failure. The benefits of increasing your preparedness supplies and abilities are immeasurable. If you are already actively growing fruits and vegetables, maybe you will want to expand to growing herbs — for seasonings or for medicinal purposes. We all know that growing our own food takes work, but the benefits, in my opinion, far outweigh the amount of work it takes. Saving money is one benefit, but being able to enjoy produce at its peak right from the garden is priceless. Then there are the benefits of being able to feed your family in times of turmoil or crisis, and the satisfaction of knowing that you can. There may be times, in the near future or further down the road, when we might be unable to run to the store and buy food. Any number of scenarios could cause empty shelves in grocery stores, like a natural disaster, a financial collapse (personal or national), or a nuclear/terrorist attack. Not everyone has a big yard or a 10-acre farm to grow food. Maybe you have just a small piece of land. There's no rule that says your garden has to be a neat, rectangular space with straight rows and furrows. It doesn't even have to be all in the same place. A square foot here and a patch over there can supply all the fresh vegetables a family can use, with plenty left over to put in bottles or your freezer for the winter. If you think you will ever want or need to have a vegetable garden, it would be good to begin dabbling in it now. If you have to start from scratch and put in a garden where lawn or weeds flourished before, you probably could not do it quickly. But if the garden is already there (from years of dabbling) and the supplies are in your shed, then you're ready to begin growing food at any time. 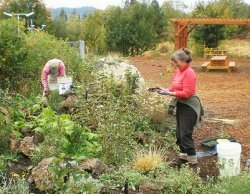 We will cover here a bit about planning your space, preparing the soil, and planting for bumper crops. If you live in an apartment and don't have land for a good-sized garden, I will cover indoor vegetable gardening, and growing vegetables or fruit in containers, inside or out on the patio. The book shown above,Square Foot Gardening, is the most helpful book I've ever read about gardening in less space, as well as timing plantings to get the most food out of the space you have. Where are the little garden spaces in your yard? How much sun do they get? Can you find some little gardens if you do some rearranging? Could you find some pots for container gardens on your patio or deck? Do you have a sunny window to grow plants indoors? I can't emphasize enough the importance of good soil. I have a "black thumb" — my house plants usually die. In spite of that, we have been able to plant a huge variety of plants in our yard (they're still alive!). It's not too difficult to get plants to grow, but spreading a good thick layer of compost will feed them, keeping them alive and healthy. Good drainage is also important. You can buy good compost by the bag at gardening centers or have it delivered by the truckload from landscaping companies. Or if you are a REAL self-reliant gardener, make your own compost with scraps from the kitchen (except meat or fat), leaves, grass clippings, and refuse from the gardens. The key to having plenty of vegetables in a small space is to plant at the right time and keep each spot producing for the entire growing season. The idea is to use the same small gardens simultaneously for two or more crops. Plant fast-growing plants in the same space as slow-growing. 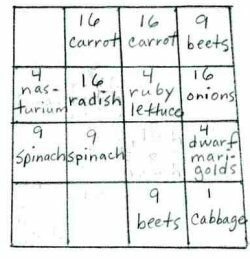 Radishes, lettuces, onions, and spinach grow quickly, so they can be intermixed with slow growers like cabbage, tomatoes, and broccoli. Corn, beans and squash are good companion plants. Plant all three in the same spot of ground at the same time. The corn will quickly grow tall, get the first sun, and the most moisture. Pole beans will climb up the cornstalks to get the sun. The squash will grow along the ground and begin setting fruit at the same time the corn and beans are harvested and cleared away. Try planting carrots (slow) with peas (fast and early), onions or potatoes (slow and below ground) with beans (fast and above ground), or lettuce (somewhat slow) with radishes (very fast). Never let a space stand empty. When the peas are finished producing, pull them up and throw the vines in the compost pile and plant squash or something else. You can always get a head start by planting seeds in peat pots several weeks earlier. On the back of all seed packets are the number of days it will take for those seeds to mature for harvesting. That information, along with knowing whether plants do better in hot weather or cool weather, will help you determine which vegetables can be used in succession planting. Vegetables need plenty of water on a regular basis to grow best. A good rule of thumb is an inch per week for small plants, two inches for large ones. However, that's a general rule at best. Your soil, the humidity, and extreme heat will all have an effect on your garden's water needs. Letting plants wilt before watering will cost you almost three weeks of recuperation time for the plant — it takes that long for the plant to get back to the point it was before it was deprived of water. Full irrigation or drip irrigation is better for your plants than sprinkling. WEEDS. There . . . I said it! That horrible 5-letter word that plagues every garden and gardener. Is there anyone who thinks weeding is fun? It's a never ending chore but, if you want great vegetables (or flowers), the weeds must be kept under control or they will rob your precious plants of all the water and nutrients. Save yourself hours and hours of weeding by spending an hour every day or so digging out small weeds rather than waiting until they're big weeds. You can put down a weed prevention cloth or black plastic. But even better, lots of compost will keep most of the weeds from germinating while it feeds your soil. The cloth or black plastic will compact the soil as well as restrict where you can plant. 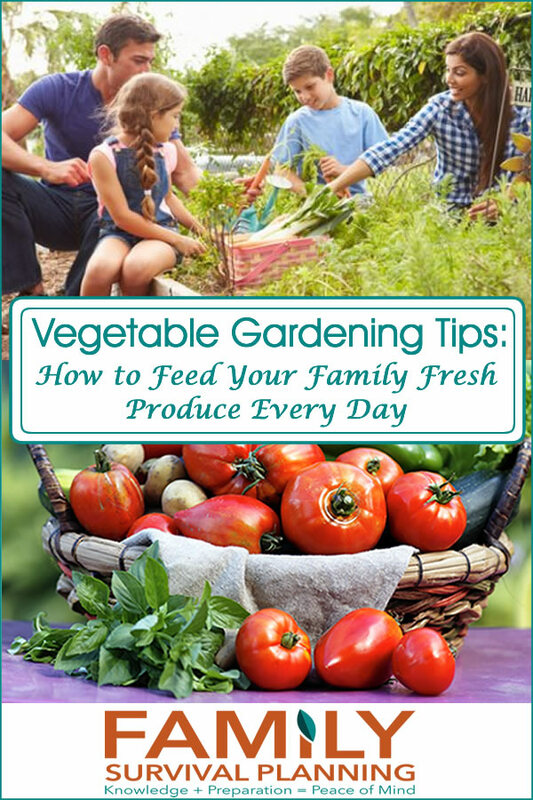 I hope these vegetable gardening tips help you get started on growing your own fresh vegetables this year. Container Vegetable Gardening - How to garden in even the smallest of spaces.